Bryce Canyon National Park is a national park located in southwestern Utah in the United States.The major feature of the park is Bryce Canyon, which despite its name is not a canyon but a collection of giant natural amphitheaters along the eastern side of the Paunsaugunt Plateau.Bryce is distinctive due to geological structures called hoodoos, formed by frost weathering and stream erosion of the river and lake bed sedimentary rocks. The red,orange and white colors of the rocks provide spectacular views for park visitors. Bryce sits at a much higher elevation than nearby Zion National Park. 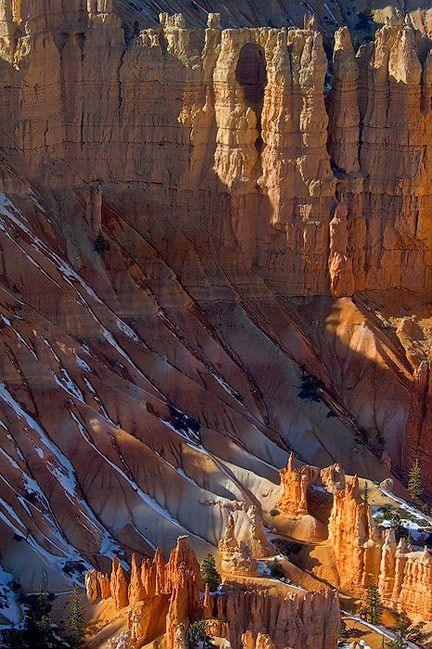 The rim at Bryce varies from 8,000 to 9,000 feet.